The Boston Red Sox have played in ten American League Division Series since this round of the playoffs began in 1995. The team has won six of these series, and three ALDS wins—2004, 2007, and 2013—ultimately led to World Championships. In those three championship seasons the Red Sox won nine games in the ALDS and lost only one. Over the years many long-time Red Sox heroes have played a significant role in the ALDS. Former pitcher Tim Wakefield was with the team for all ten series, and of course Big Papi has been an offensive force during his seven ALDS appearances. But in many years the spark for an ALDS victory has come from an unexpected source. 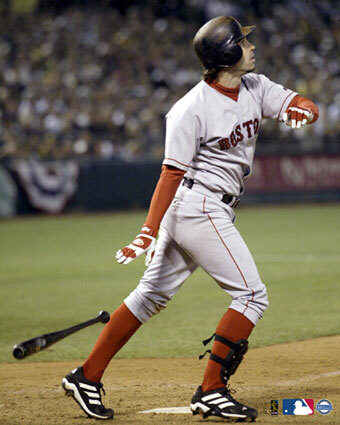 In 2003, Todd Walker and Trot Nixon came through when least expected, helping the Red Sox to dramatic victories. And in 2004, both Johnny Damon and Derek Lowe stepped forward to help launch the club towards its first World Championship in 86 years. Did you ever wonder if major league ballplayers get nervous during the playoffs? We can thank former second baseman Todd Walker for his candor in answering that question. Walker joined the Red Sox before the 2003 season and he played 144 games for the wild-card winners. He still vividly remembers his first at-bat in Game One of the 2003 ALDS against the Oakland A’s. Todd Walker batted .283 and he hit 13 home runs in 2003. But not even the most optimistic Red Sox fan expected what Walker did next. The Red Sox were down 3-2 to the A’s in the seventh inning and Oakland manager Ken Macha had replaced Hudson with reliever Ricardo Rincon. With two outs shortstop Nomar Garciaparra singled, bringing Walker to the plate. Todd took two balls from Rincon and deposited his next pitch into the right-field bleachers at Network Associates Coliseum. Walker’s second home run of the game gave the Red Sox a 4-3 lead. Walker’s memorable performance wasn’t enough and the Red Sox lost 5-4 in 12 innings. A 5-1 loss the next night put the A’s up 2-0, but an extra innings 2-1 win in Game Three back at Fenway Park kept Red Sox hopes alive. Game Four at Fenway Park was another “must-win” for Boston. Once more Todd Walker came through with a sixth-inning home run helping the team to a 5-4 win. In Game Five Walker scored on a three-run Manny Ramirez home run and the Sox took the Series with a 4-3 victory. Todd Walker would never have had a chance to shine in Games Four and Five if Trot Nixon hadn’t come through in Game Three of the 2003 ALDS. Nixon had just finished his fifth full season with the Red Sox and it was by far his best year. The 2003 Boston Red Sox were an offensive juggernaut. That team was powered by sluggers David Ortiz and Manny Ramirez, but in 2003, Trot more than held his own. Nixon ranked seventh in the American League in on-base percentage (.396), fifth in slugging average (.578), and fourth in on-base plus slugging (.975). Trot had gone 0-4 in Game One and manager Grady Little benched Trot in favor of Gabe Kapler for the next two games with lefthanders pitching for Oakland. After nine innings Game Three was tied 1-1. Trailing 2-0 in games, the Red Sox were one run away from elimination. In the last of the eleventh, with the score still tied at one-each, the A’s brought in rookie right-hander Rich Harden. With one out, catcher Doug Mirabelli singled and manager Little sent Trot Nixon up to pinch-hit for Kapler. With the count at 1-1, Nixon pounced on a Harden fastball and drove the game-winner on a line deep into the centerfield bleachers landing among the celebrating fans. Every Red Sox player was hurting after their heartbreaking loss to the Yankees in Game Seven of the 2003 ALCS. But Johnny Damon was hurting physically as well. 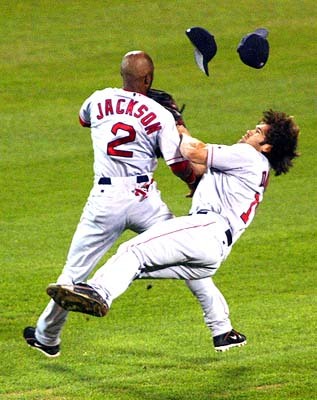 The Red Sox were putting the finishing touches on their dramatic comeback against the A’s in the 2003 ALDS, when Johnny Damon and second baseman Damian Jackson collided violently in the seventh inning of Game Five. “I have tears in my eyes just talking to you about how much I hurt after that collision” Damon emphasizes. Given what we know about concussions today Damon’s injury would likely have sidelined him for the rest of the season. In Game One Johnny singled, doubled, stole a base, and scored twice to help the Red Sox to a 9-3 rout of Anaheim. And in Game Two, he singled twice, scored a run and stole his second base of the series in an 8-3 win. “My game was getting on base as the leadoff man and then using my speed, so I felt I had done my job,” he says. With the Red Sox up 6-1 after six innings in Game Three at Fenway it looked like a very quick series indeed. But after the Angels cut the lead to 6-2, Vladimir Guerrero drove a grand slam home run into the visitor’s bullpen in right, and just like that the game was tied 6-6. Guerrero’s home run silenced the Fenway crowd and the Red Sox bats went silent for the next three innings. At the end of the ninth inning the score remained at 6-6. Red Sox pitcher Derek Lowe, an eight-year veteran with the team, expected to spend the 2004 ALDS as a spectator in the Red Sox bullpen. “I had a lousy year in 2004,” Derek admits. Derek retired Jeff DaVanon on a fly ball but then walked Jose Molina to put the tying run on base. Molina was sacrificed to second and David Eckstein followed with an infield hit to put runners on first and third with two outs. But Lowe got Chone Figgins to ground-out and the Red Sox came to bat in the last of the tenth with the score still tied. Johnny Damon started things off with his third hit of the game, a single up the middle, but Mark Bellhorn forced him at second base. 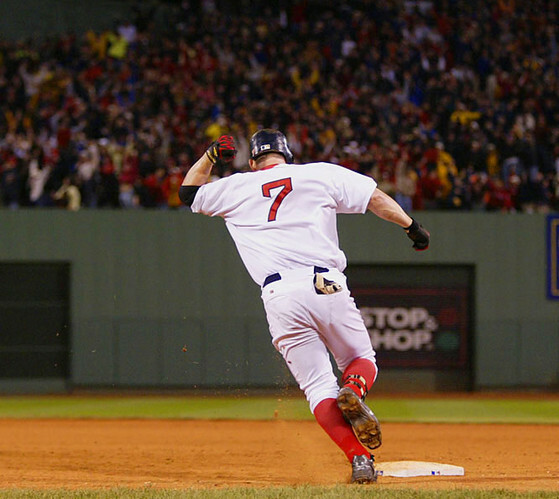 After Manny Ramirez struck out, David Ortiz stepped to the plate with two outs and the winning run on second. Big Papi ended the suspense, the game, and the series with a towering home run over the Green Monster to give the Red Sox an 8-6 victory. Johnny Damon finished the series with seven base hits, an on-base percentage of .500, and three stolen bases. 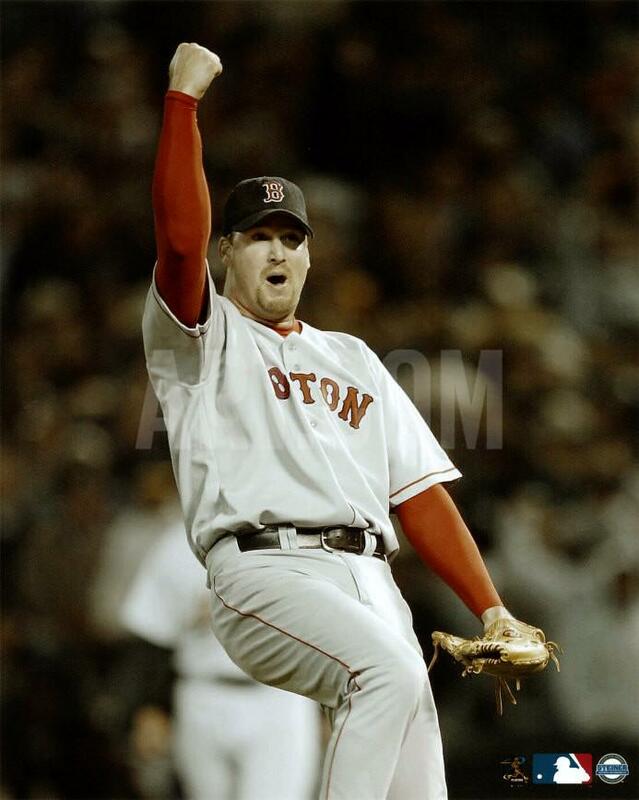 Derek Lowe was credited with the series-clinching win. And the Red Sox had taken the first step towards their first World Championship in 86 years! Such great memories Herbert! Thanks for writing this! Such great memories Herb! Thanks for writing this!